Cohen’s testimony, at less than 4,000 words, doesn’t change the fundamental picture so much as fill in essential gaps. Cohen will say that Trump was informed of conversations with WikiLeaks about releasing emails related to Hillary Clinton—something the president has denied. Cohen will present a copy of a check reimbursing him for hush money, dated August 2017. While Cohen has already implicated Trump in a violation of campaign-finance law in court pleadings, that check places the crime during Trump’s presidency. Cohen will allege that he lied to Congress at Trump’s direction, though by his own account the direction was implicit. Finally, Cohen will claim that Trump was aware of a meeting at Trump Tower between campaign officials, including his son and son-in-law, and Russians in June 2016. And those are only the most legally consequential claims. Cohen will also say that Trump has made flagrantly racist comments about black people. He will provide documentation backing up reporting in the press that Trump used money from his charitable foundation to purchase an oil painting of himself. Of all the news, the thing that might personally enrage Trump the most is that Cohen plans to produce documents showing that Trump’s net worth a few years ago was much smaller than he said publicly—a topic that infuriates the president. Even if only some parts of Cohen’s testimony are credible and substantiated, they would meaningfully advance the Russia story and other allegations surrounding Trump. 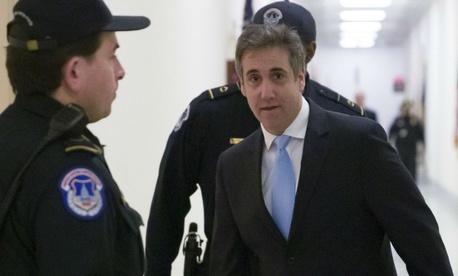 The most readily proved will likely be the hush money, since Cohen has already offered legally binding statements, as part of a guilty plea, that explain the scheme. While Cohen’s description of the arrangement to pay two women who alleged that they’d had sexual affairs with Trump was already public, what is new is Cohen’s claim that Trump reimbursed him after taking office. In April 2018, just months after Cohen says he received the check, Trump denied any knowledge of payments. More recently, the president has claimed they were a personal transaction and unrelated to politics, and thus did not violate the law. But Cohen’s claim is based entirely on what he heard. So, too, is his claim that Trump was aware of the June 2016 Trump Tower meeting. In that incident, Donald Trump Jr. was informed that the Kremlin was backing his father’s campaign. He agreed to a meeting where he expected to receive dirt on Clinton from Russians. He, his brother-in-law Jared Kushner, and then–Trump campaign chair Paul Manafort all attended. All parties say no dirt was exchanged. When the meeting was revealed by The New York Times in the summer of 2017, Trump dictated a misleading statement about the meeting, but he has said that this was the first time he’d heard of it. Cohen’s explanation of his lies to Congress may not satisfy all listeners, either. A blockbuster BuzzFeed report in January said Cohen had told investigators that Trump instructed him to lie. In his testimony, Cohen says that Trump did coerce him into lying, but that he was too savvy an operator to do so in explicit terms. Yet as Cohen himself notes, his testimony will be suspect from the start. He has pleaded guilty to lying to Congress and to bank fraud and tax evasion. The White House has repeatedly said Cohen is not to be believed, most recently in a statement ahead of this week’s testimony. The president called him a “rat,” a Mafia-inflected term that, intentionally or not, seems to confirm that Cohen knows something damaging about him. Trump’s allies have also attacked Cohen. In an astonishing tweet, since deleted, Representative Matt Gaetz of Florida said on Tuesday, “Hey @MichaelCohen212—Do your wife & father-in-law know about your girlfriends? Maybe tonight would be a good time for that chat. I wonder if she’ll remain faithful when you’re in prison. She’s about to learn a lot.” Gaetz was quickly accused of witness tampering. Cohen’s testimony had already been postponed after he complained that Trump was threatening him on Twitter.